A collection of classic and new big band compositions. 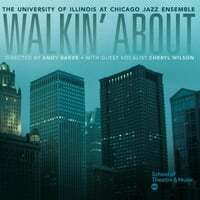 Walkin' About is the latest release from the UIC Jazz Ensemble conducted by Director of Jazz Studies, Andy Baker. There are nine tracks featuring classics by Thad Jones and Oliver Nelson, as well as three movements of Kenny Wheeler's masterpiece, the Sweet Time Suite and one of Baker's original composition. All the performers are students in the University of Illinois at Chicago's Jazz Studies Program, part of the School of Theatre & Music. I was afforded the opportunity to perform on this project! The tunes were fun to play on. During the recording, there was an energy and commitment to sound as one musical voice.